Thyroid nodules have a high prevalence among general people with palpable lumps arising in around 4-7% of the population. Read on to find out all about the causes, symptoms, diagnosis and treatment of these abnormal lesions. The term refers to solid, fluid-filled nodules that develop within the thyroid gland, which can be found just above the breastbone and at the base of the neck. The ICD9 Code for Thyroid nodules is 241.0. The size of these lumps may vary from a few millimeters to several centimeters. These are usually of minor clinical significance. However, lesions more than 3 cm in size have a greater possibility of being malignant. In later stages, some thyroid nodules can become malignant (cancerous). Nodules which become malignant are likely to grow in size very quickly. However, the size of a nodule cannot exactly predict whether or not it will turn cancerous. These nodules are classified into three types – hot, cold and warm. The classification is made on the appearance of the lesions in nuclear imaging on the basis of their comparative uptake of radioactive isotopes. Hot nodules suggest presence of autonomously functioning nodules. Cold nodules signal nonfunctional or hypo-functional thyroid tissue. Warm nodules indicate normal thyroid function. As per research, 5% of thyroid nodules are hot, 10% are warm and 85% are cold. Around 85-95% of all types of nodules are benign in nature. Only 5% of hot nodules and 5-8% of cold or warm nodules are malignant. Nodules in the thyroid gland are also differentiated into simple and complex. Those filled with only serous fluid are termed as simple nodules. These can be big or small in size and arise suddenly. Bumps that consist of both fluid and solid components are referred to as complex nodules. Unless removed by surgical means, these bumps may cause swallowing difficulties or neck pain. If lumps in the thyroid gland comprise of abnormal thyroid tissue, the normal production of triiodothyronine or thyroxine may be affected. This can result in an overactive thyroid gland. Lumps that comprise of abnormal thyroid tissue are referred to as “toxic”. A single nodule in the thyroid gland is often known as a toxic adenoma or toxic thyroid nodule. Toxic nodules in the thyroid gland account for approximately 5% of all hyperthyroidism cases. These are hypoechoic nodules located in the thyroid gland. A hypoechoic nodule refers to a solid or fluid-filled lump which reflects weakened sound waves compared to the adjoining tissue when a sonogram or ultrasound test is carried out. These abnormal bumps can be found to arise in any area of the body. However, it is most commonly noted in the thyroid. These abnormal lumps develop when a nodule in the thyroid gland begins to produce its own thyroid hormones. Due to this reason, patients with these lesions often suffer from hyperthyroidism. The exact cause of these lumps is not clear. However, researchers suspect the nodules to develop due to genetic factors. In some cases, it can indicate the presence of an underlying condition known as Plummer’s disease. Nodules can be produced by the thyroid gland by a deficiency of iodine in your diet. Iodine is commonly added into table salt as well as other food items in the United States. This explains why US has a low incidence of this disorder. Some thyroid adenomas manufacture excessive thyroid hormones that are much more than the amount normally regulated by the pituitary gland. This leads to Hyperthyroidism, a condition marked by excessive production of thyroid hormones. Deterioration of benign thyroid nodules (thyroid adenomas) often leads to the development of cysts (fluid-filled cavities) in the thyroid gland. Thyroid cysts often contain solid components along with fluids. The solid components, though generally benign, can be occasionally malignant. The condition involves chronic inflammation and enlargement of the thyroid gland, thereby reducing its activity and giving rise to Hypothyroidism. The term “Goiter” refers to an increase in the size of the thyroid gland. This can result from a thyroid disorder or an iodine deficiency. 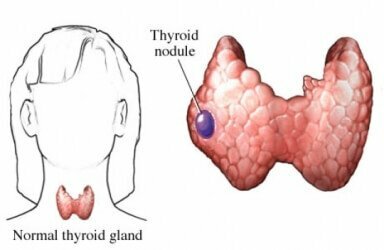 Thyroid nodules may be solitary or multiple. A multinodular goiter comprises of multiple distinct nodules inside the goiter, for reasons unknown. In extreme cases, goiters may constrict airways, blood vessels or the esophagus. It is only in rare cases that a nodule of this type is found to be cancerous. The condition has a strong possibility of arising in individuals with a family history of endocrine or thyroid cancers. It may also arise in people older than 60 or younger than 30, or having a history of radiation exposure – especially to the neck and head area. If the nodule is large, firm and painful, the possibilities of malignancy can be greater. This however, does not indicate that all lumps of this type can be cancerous. The treatment for these nodules is based on their type. The form of treatment depends on whether the nodule is benign, whether it causes hyperthyroidism or whether it is cancerous. In this process, the lesion is treated with Levothyroxine such as Synthroid or Levoxyl. Levothyroxine is a synthetic type of Thyroxine that can be taken as a pill. Supplying extra thyroid hormone aims to make the pituitary gland produce lesser amounts of TSH, a hormone stimulating thyroid tissue growth. However, this is more of a theoretical approach and there is no concrete evidence of shrinkage of benign nodules by the use of this method. Occasionally, surgery may be required to remove a nodule that is benign but large enough to cause respiratory or swallowing difficulties. Operative procedure is considered to be the best choice for individuals with enlarged multinodular goiters. If a biopsy clearly confirms presence of a benign thyroid nodule, patients may be asked to wait and watch the situation. Doctors may conduct a physical examination and Thyroid function tests at steady intervals. Biopsy may also be required if the nodule grows bigger in size. Nodules detected as suspicious or indeterminate by a biopsy should be thoroughly examined for signs of cancer. If the size of a benign thyroid nodule remains unaltered, patients may never require treatment beyond careful supervision. Cancerous nodules in the thyroid gland are usually removed through surgery, often along with much thyroid tissue. The operative procedure used in this case is known as Near-total Thyroidectomy. However, the process includes certain risks. This involves damage to the nerve that controls the vocal cords. The surgery may also impair the parathyroid glands. These are four small glands positioned at the posterior part of the thyroid gland which regulate the calcium level in the bloodstream. Patients undergoing Thyroidectomy often require lifelong treatment with levothyroxine to supply thyroid to their body. This helps maintain normalcy of the level of the thyroid hormone. Radioactive iodine may be administered in a liquid form or as a capsule. 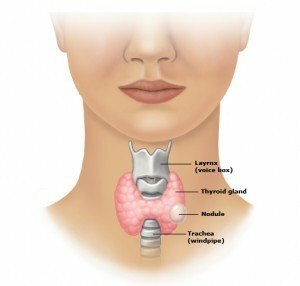 Once radioactive iodine enters the body, it is absorbed by the thyroid gland. This causes shrinkage of the nodules and remission of the symptoms of Hyperthyroidism, generally over a period of two to three months. In some cases, an anti-thyroid medicine such as methimazole (Tapazole) may be recommended to the patient. The drug effectively reduces the symptoms of hyperthyroidism. This is usually a long-term treatment and can have adverse side-effects on the liver. Due to this, it is necessary to discuss the risks and benefits of this treatment option with a doctor before actually using it. If treatment with radioactive iodine or anti-thyroid medications isn’t an option, you may be a candidate for surgery to remove your thyroid gland. Surgery also carries certain risks that should be thoroughly discussed beforehand. Check out these photos of Thyroid nodules to know how they look like. You may find these Thyroid nodules images quite useful to get an idea about the physical appearance of these lumps. Nodules in thyroid gland are often tested through a process known as Fine-needle aspiration (FNA) biopsy. The technique aims at finding out whether the lesion is benign or malignant in nature. The process involves inserting a very thin needle into the lump and removing a cluster of cells to be used as a sample. The sample is later sent to a laboratory for microscopic analysis. A thorough analysis under a microscope helps reveal the presence of cancerous cells. Doctors often use an ultrasound to position the needle accurately. The process can be carried out in a doctor’s office and takes only about 20 minutes to perform. When non-cancerous, these do not give rise to any life-threatening complications. Many nodules do not require cure. However, these lumps only require follow-up. Benign nodules that require treatment have a excellent prognosis. In case of cancerous nodules, prognosis is based on the type of cancer. If parathyroid glands are removed or suffer accidental damage during surgery, patients may suffer from Hypocalcemia due to the development of Hypoparathyroidism. Hypocalcemia is a condition caused by low level of calcium in blood. The condition cannot be prevented in any way. This is because the exact cause of development of most nodules is unknown. However, a diet comprising of enough iodine-rich foods is believed to prevent the growth of these lumps. If you feel a lump or an abnormal growth in the middle of your lower neck, get in touch with a physician. If the lump is diagnosed to be a thyroid nodule, you will probably be referred to an endocrinologist who would decide the best possible remedy for you.